The 30X Zoom Telephoto can used as a telescope which great for watching the ball game,seaside,concert,sightseeing and so on. Focusing Ring – The focusing ring on the phone lens makes you to adjust the focus by hand freely. By manual focusing, you can change the focuses of the image to make better effect. 18x-30x Zoom Ring – Most of telephoto lens on market is fixed zoom. Our zoom ring can be adjusted range 18x-30x. More importantly, imaging is always clear. MC UV Filter – Free bonus UV lens that can absorbs UV rays and protects telephoto optical lenses. Universal Clip – In order to meet the needs of all mobile phones in the market, the improvement of universal clip is currently compatible all single and dual lens phones. The pixels of the photos depend on your phone. It is better to take off your phone case for taking photos. The telescope is made of metal and is a bit heavy. It will slide out the phone camera center if you install it directly. It is recommended that you install a triangular bracket to balance it. 【PROFESSIONAL 18X-30X TELEPHOTO ZOOM LENS】- The telephoto lens is made of optical glass with Multi-Layers Coating that greatly enhanced the clarity while shooting, also reduce glare, reflection, ghosting and make the picture distortion below 3%. Our lenses can be adjusted up to 30X. Make your phone produces close-ups and long range shots without compromising image quality, take picture that your phone currently can’t. 【PREMIUM DESIGNED & EASE OF USE】- This phone telescope designed with industrial grade aluminum. It has dual adjustments to get clearer photos from miles away. Rotating the objective ring is to adjust and fix the focus. Rotating the eyepiece ring is to eliminate the dark corners around the picture. Detachable clamps is equipped with a screw fixing device can adjust and fix the lens clip according to the thickness of the phone. 【HIGH QUALITY MC UV LENS】- The high-quality MC UV Lens use Multi-Layers Coating technology to absorb ultraviolet light with a light transmittance of 99.9%. Greatly improve photo sharpness and color saturation. Suitable for shooting in seaside, mountain, snowy and open areas. Another important use is to protect the Optical Telephoto Lens. 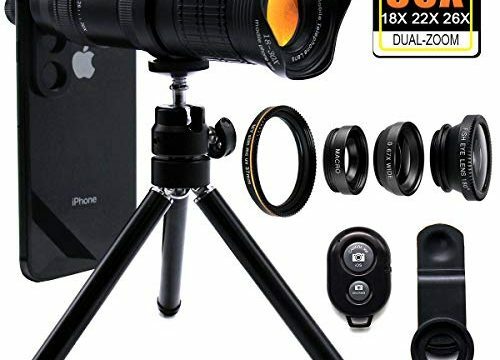 【WHAT YOU GET & WIDE COMPATIBLE】- You will get 4 in 1 phone lens kit including 18X-30X telephoto zoom lens, wide angle lens, macro lens and fisheye lens. Removable and solid clip-on design that built with fixed valve to adjust the tightness, not only stable, but also widely used. Both single and dual cameras can be used. 【BONUS LENS KIT & CUSTOMER GUARANTEE】- The telephoto lens kit works with tripod and remote shutter included, which offer stability while shooting. Carrying case make it easy for traveling, separate packing design and professional lens cover to prevent friction, inside lens use guide provide you detailed instructions. We also provide you 30 days 100% money back and 12 month replacement guaranty. Please free to contact us, if you have any question.